Ice cream and frozen yogurt businesses can be found in nearly any community. But Reis & Irvy’s still thinks there’s room for disruption in the industry. Reis & Irvy’s does sell frozen yogurt. But that’s about where the similarities end. Instead of a storefront or stand, the company operates a series of machine-operated kiosks. Instead of employees, every machine is powered by robots. This model doesn’t just make the company efficient — though that is a major benefit. It also creates a truly unique experience for customers that normally have no shortage of options when it comes to frozen desserts. Each machine has six flavors, including one rotating seasonal flavor. There’s also a variety of toppings to choose from, and options for customers with dietary restrictions like gluten or dairy sensitivities. Customers simply select their options using an interactive touchscreen interface. Then the machine puts it all together in one minute or less. They also have an agreement with Dannon to serve their YoCream soft serve with active cultures, along with Silk for their almond milk. The company uses a franchise model to expand into new markets. But again, it’s a bit of a different franchise model than what business owners have traditionally been used to. The Reis & Irvy’s team will actually scout locations for those interested in becoming franchisees. Their frozen yogurt stations are normally located in shopping centers, airports, college campuses, and other high traffic locations. So you simply need to claim a territory, and they’ll do much of the heavy lifting for you when it comes to getting started. The company has several plans available. The fees range from $172,500 to $600,000 depending on how many machines you want to get started with. Then once you get up and running, the operating costs are fairly low compared to other businesses, since you don’t need to pay a full staff of people. And they’re fairly low maintenance as well. So it could be a perfect opportunity for someone with the startup capital available who wants to own a franchise but doesn’t have a ton of extra time. Automation is certainly making an impact on a variety of industries. This is just the latest example of technology and robotics making a business model more efficient. 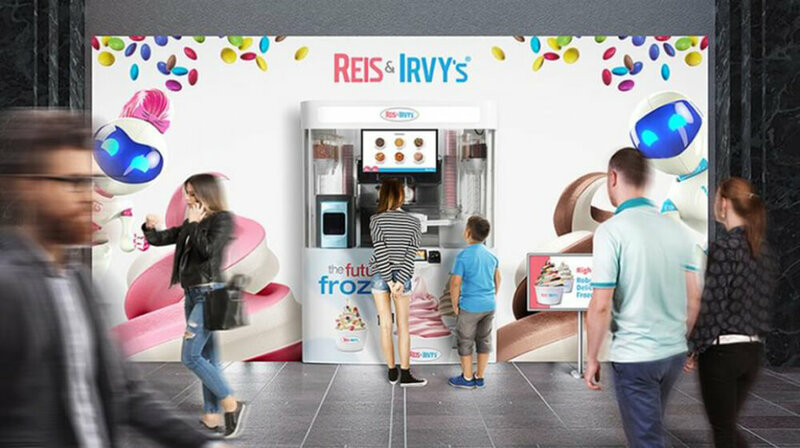 So whether you’re looking for a new franchise opportunity or not, you may be able to learn from the innovation that Reis & Irvy’s has used in creating this new model. Yates also noted that the available territories are going fast. You can visit the company’s website to request information or claim your territory of choice.